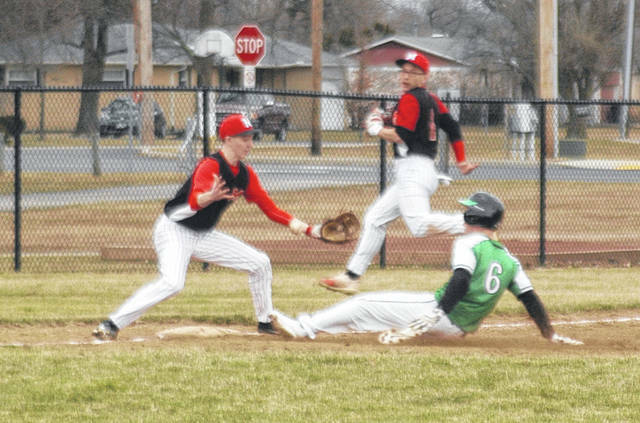 Eric Corbett slides in safe at third during a scrimmage against Milton-Union held Wednesday afternoon at ‘The Yard’ at Northmont High School. Keaton Kesling belts a double to deep left field against Milton-Union. Pitcher Nate Ryhlick delivers a pitch to the plate. Nick Newman makes an off-balance throw to first base. 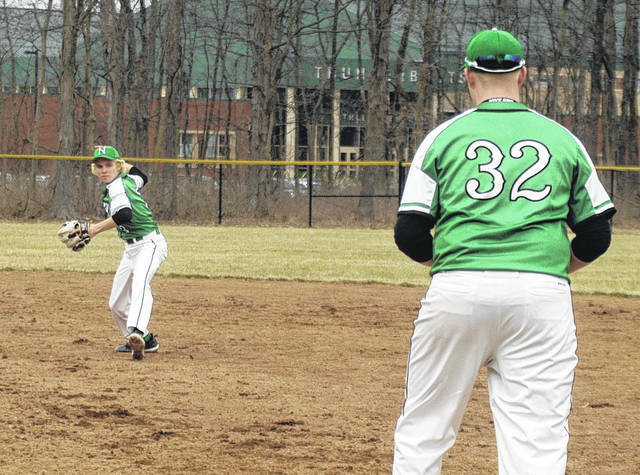 Second baseman Tyler Schock prepares to throw to first baseman Brendan Siehl for an out. March 26 at Navarre 7:30 p.m. Navarre, Fla.
April 5 Beavercreek 5 p.m.
April 8 at Winton Woods 5 p.m.
April 9 Oakwood 5 p.m.
April 11 at Waynesville 5 p.m.
April 12 at Springfield 5 p.m.
April 15 at Lebanon 5 p.m.
April 16 Lebanon 5 p.m.
April 18 Centerville 5 p.m.
April 22 Springboro 5 p.m.
April 23 at Springboro 5 p.m.
April 26 at Fairmont 5 p.m.
April 27 Greenville 5 p.m.
April 29 at Miamisburg 5 p.m.
April 30 Miamisburg 5 p.m.
May 2 Troy 5 p.m.
May. 3 Wayne 5 p.m.
May. 6 at Sidney 5 p.m.
May 8 at Tippecanoe 5 p.m.
May. 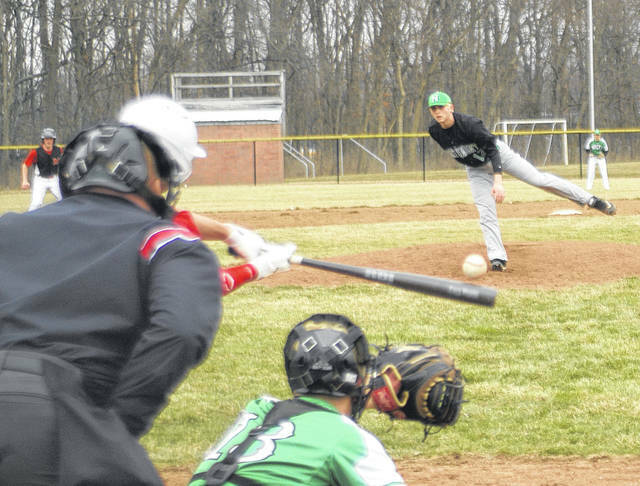 9 Carlisle 5 p.m.
May 3 Wayne 5 p.m.
May 6 at Sidney 5 p.m.
May 9 Carlisle 5 p.m.
CLAYTON — With a lineup consisting of mostly inexperienced players at the varsity level, the Northmont baseball team can expect some growing pains as the season unfolds. Despite having only three returning players with significant varsity experience, first year head coach Ross Kincaid is optimistic about the 2019 season. Kincaid, a 1997 Northmont grad, has 18 years of experience coaching baseball at Northmont. He spent the previous two seasons as head coach of the JV team. He served as varsity assistant coach from 2014 to 2016, was the freshmen head coach from 2005 to 2013 and JV assistant coach in 2003 and 2004. Returning players with varsity experience this year are three seniors: Justin Combs (catcher), Jason Kohr (pitcher) and Will Miller (outfielder/catcher). Combs served as the starting catcher for most of the 2018 season before suffering an injury when Miller stepped in to handle the backstop duties. Kincaid said that trio will be looked to for much needed leadership on a team with many talented and spirited players. Despite the lack of varsity experience, the 2019 team has embraced this year’s program theme of “moving forward” by working hard each day during the first five weeks of practice. In addition to the three returning seniors, three more seniors should help to bolster the Bolts lineup. They are Edward Hardaway (outfielder), Dalton McClaskey (pitcher/infielder) and Reagan Schommer (pitcher/infielder). The Thunderbolts will rely on a talented group of juniors consisting of Eric Corbett (outfielder), Jacob Cox (infielder/pitcher), Jakob Hughes (pitcher), Keaton Kesling (outfielder/infielder), Noah McGilton (infielder/pitcher), Nick Newman infielder/outfielder/pitcher) , Vince Sarno (catcher), Tyler Schock (infielder), Brenden Siehl (infielder/pitcher), Jaren Slusher (pitcher/outfielder), and Andrew White (infielder/pitcher) to compete with the top teams in Division 1 baseball in the Dayton area. Once back in the Buckeye State, the Bolts will host a GWOC cross-divisional game against Beavercreek on Friday, April 5 before a showdown with its rival from across the dam, Butler, on Saturday, April 6 at high noon in ‘The Yard.’ Throughout the balance of April and early May, Northmont will battle GWOC divisional foes Lebanon, Springboro, and Miamisburg twice each in addition to its other GWOC cross-divisional opponents Springfield, Centerville, Fairmont, and Wayne. 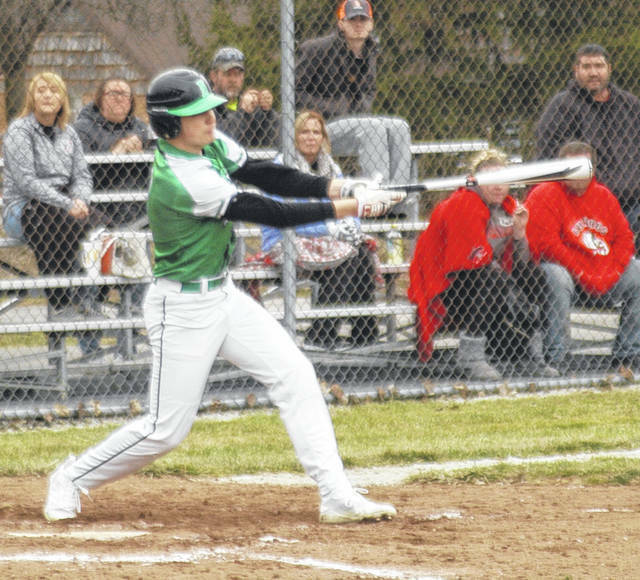 Northmont supporters are sure to enjoy a few special days at ‘The Yard’ including a ‘Green Out’ for the varsity game against Butler on April 6, ‘Teacher Appreciation Night’ vs. Lebanon on April 16, the ‘Hall of Fame Game’ against Greenville on April 27, and ‘Senior Night on Friday, May 3. The Thunderbolts would also like to invite all varsity, junior varsity, and freshmen team fans to support Northmont F.I.S.H. by bringing canned or non-perishables goods the week of April 13-20 to stock the community food pantry. 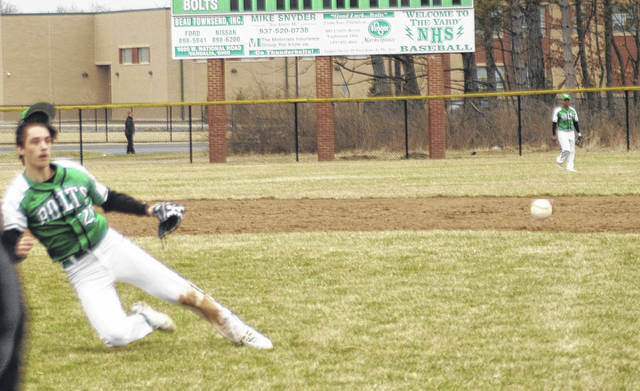 In addition to the varsity team, the junior varsity and freshmen baseball teams are poised to provide a great deal of excitement during the 2019 campaign, according to Kincaid.